I’m an avid listener of podcasts on the TWIT.tv network, through which I was introduced to Matt Cutts. Matt is a Google employee who is responsible for the elimination of spam in Google email. I hate spam, and therefore through the inverse property of internet absolutes, I love Matt Cutts. Aside from this great public service to humanity, Matt has been doing a monthly 30 day challenge, which he presented as a TED talk. I think the genesis of the 30 day challenge came from the desire to try new things, to enhance his life, and to form new habits. As Matt says, it turns out the 30 days just happens to be the right amount of time for a new challenge to become a habit. It also fits nicely into a monthly boundary, which is easy to track. I started my 30 day challenge this December. With twins on the way, I’ve been feeling the need to get the house organized. The room that is becoming the nursery had been used as a big storage closet since we moved here a year ago. I needed to clean that room and start with a fresh slate. The babies are going to bring a whole new set of devices, gadgets, toys, and clothes into a house that is full of the collected belongings of a couple who has been married 10 years. People tend to collect a lot of stuff in that time. My challenge this month is to declutter and organize the house, to remove what is unnecessary, and what has been bogging us down as we’ve moved around the country. Each day, I have to make some progress towards that goal, either by cleaning the baby room, donating some clothes or household items, or organizing our files. So far, this challenge has been excellent, and I’m pleased with the results. 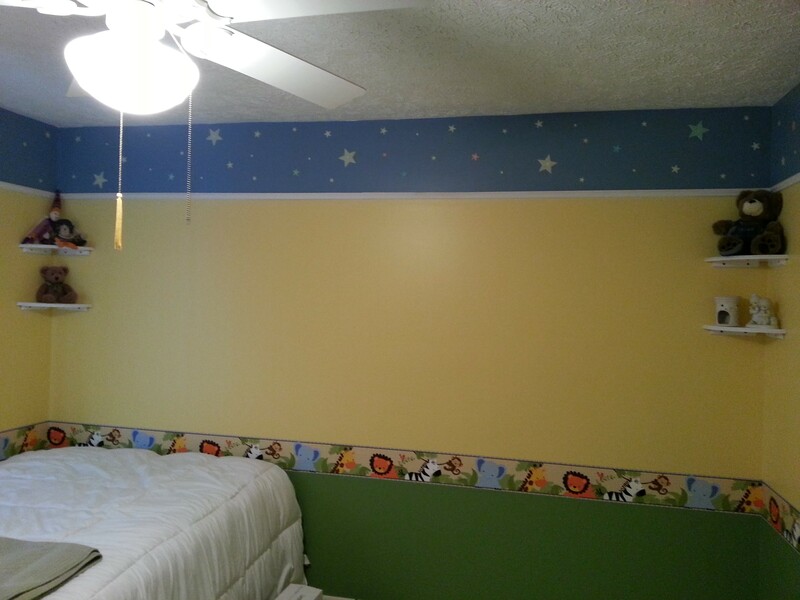 I’ve finished the baby room, and yesterday, I hacked my desk to hide all cords and allow my keyboard tray to slide into a completely hidden position. I’m almost done organizing my files, and next, we’ll tackle our old clothes, many of which should be donated for lack of use. We are well on our way to having a well organized house, before the twins arrive and force increased entropy. I plan to continue these challenges, knowing full well that I might miss a month or 2 post baby delivery. But I hope to continue this exercise in perpetuity, always pushing myself to try new things, improve myself, learn a skill, etc. This is a trait I want to pass on to my children. Today is International Table Top Day (http://www.tabletopday.com/), as so declared by Geek & Sundry and the Table Top show created by Wil Wheaton. I absolutely love this show, because it has a great host, awesome guests, funny banter, and features games I love, and games I’ve never heard of, but know I’ll love. I love board games, always have. I played them constantly as a kid, including all the standards like Monopoly and Life. Later, after college, I would host game nights at my condo for friends with party games like Taboo and Cranium. It was around this time that I was first introduced to Settlers of Catan. I found more friends who were far more deeply involved in board gaming, and taught me that American boards games were just the tip of the iceberg. New and exciting games were being created all over the world and brought to the US, games you don’t find in Target and Toys R Us. It was an exciting time to be a gamer. Sheila loves to play games too. She’s probably not as into it as I am, but she indulges my gaming need, and we play a couple times a month. We love word games like Saygo, Quiddler, Scrabble, or card games like Skipbo. Since we moved to Lansing, we haven’t found any gaming friends, and often her work schedule doesn’t facilitate gaming parties. So today we had our own private Table Top celebration. 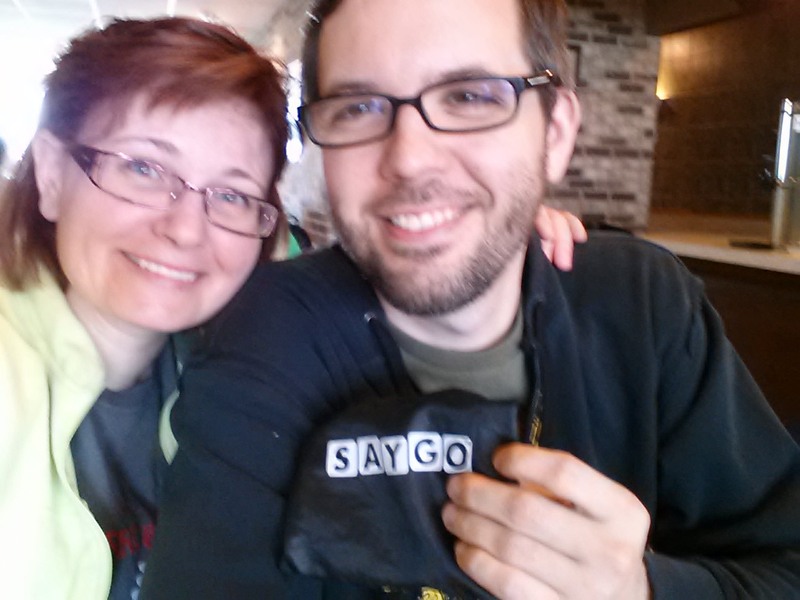 We went to the coffee shop, and played Saygo. It’s a word game introduced to me by my friend Erin, where you build an ever growing, ever changing crossword puzzle. 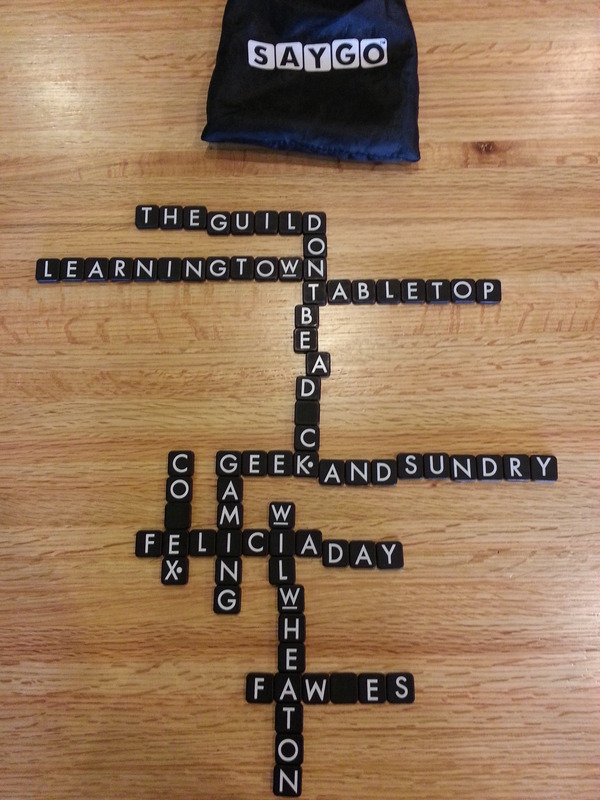 We took a few minutes at the end of our session to make a special crossword puzzle for our friends at Geek and Sundry. Keep up the awesome word, G&S, Felicia, and Wil. We love what you’re doing! I wrote this piece a few days ago as I’ve been dealing with my anxiety about the approaching match. I have anxiety because last year, we did not match, and had to scramble. This year, I don’t want to go through that again, but I’m sure I’ll know someone who wil, and I remembered there were several people that helped us understand how the scramble process worked, and gave support through that time, and I wanted to return the favor. This is it. Four years of medical school, dozens of exams, hundreds of patients, and night upon sleepless night of study. It’s all come down to this: The Match! Many people think this is the most important day on your medical journey, but let’s ratchet back slightly and call this a key date, akin to taking your MCAT, getting accepted to med school, and passing your Step 1 boards. Surprisingly given the importance though, many people don’t know the full process. Even if you are a spouse or significant other of a medical student, you should know the process, for peace of mind, and to support your med student. Also, since this is where you’ll spend the next 3-5 years of your life, and perhaps longer, residency deeply impacts your life too. Let me start off by saying that the following information is based solely on my experiences, research, and conversations with fellow medical student spouses. I’m in no way an expert, so please do your own research. Ask existing residents, talk to advisors at your medical school, or call the AOA/NRMP. Also, in totality, what you are about to read applies to DOs, and in part to MDs. If you are a DO, you can participate in both the AOA match, and the NRMP match for allopathic doctors. My wife is a DO, therefore my perspective is tuned to that view. There are many variables in this process, too many to list them all. But as an example, you could be a 4th year med student applying for the match for the first time, or a 1st year resident applying again after unsuccessfully matching last year, or changing specialties. You could be applying for 1 or multiple specialties, such as Ob/Gyn, and Family Medicine (as a backup). You could be applying by yourself, or for a couple’s match with your spouse. Finally, this process is always evolving, so please refer to the AOA and NRMP websites for the latest information. This year, the NRMP has responded to problems with the scramble by implementing a new SOAP process. I truly believe the match tries to be a fair and even system. There are many steps before the match, but in quick review, you will have taken step 2 of the boards, chosen a specialty, submitted the ERAS, applied to several residency programs, accepted some interviews, participated in said interviews, and determined a rank order list (ROL) of residencies to which you would like to match. There are a hundred specific nuances that I will gloss over for the time being, such as specifics to the military match, how to do a couples match, where to interview if your specialty requires traditional year residency, what your plans are for fellowship, working in under served areas in the hopes of receiving loan forgiveness, etc. However, at this point you should have determined what programs you would like to attend for the next 3-5 years, and in what order you prefer. You might also have received specific feedback from the director of programs which will rank you high on their list. Not all programs will directly inform applicants of their preferences, but some do to better ensure they get their top matches. Remember, the rank process favors the medical student, not the program, and the rank is very competitive. For most people, the DO match comes first. There can be exceptions: for example, the Urology specialty performs allopathic match in January. By the end of January, your ROL should be submitted on the AOA match website (http://www.natmatch.com/aoairp/). This date for 2012 is January 27th. Once this date has passed, if you have submitted an ROL, you cannot withdraw from the AOA match. And remember, the match results are binding! In 2012, the match takes place on February 13th. Sometime in the morning, applicants will receive notification that they have matched or not, and if so, with which program. If you match, you will be automatically removed from the NRMP match, and you must accept the position you have received. The residency program is obligated to send you a contract within 10 days, and you are obligated to sign and return within 30 days. Again, there have been exceptions where people have backed out of their contracts despite the match results, but these are rare. Also, once you sign the contract, your new residency program will have numerous more steps you need to complete, like background check, licensing paperwork, application, etc. This is akin to the paperwork you would complete with just about any new job. Just like the DO match, the MD match has an ROL you’ll need to compete. In 2012, the date is February 22nd. The MD match differs from the DO match in that on match day, applicants will only find out if they matched or not, but they won’t find out where they matched until 4 days later. Technically, the NRMP refers to the latter date as Match day, but I would rather call it Reveal day. If you are here, there is one piece of advice you must follow above all others: STAY CALM! Trust me, my wife and I were there last year, and we’ve had friends who were there in previous years. We know the feelings, the anger and shame of not matching, the frustration at the complexity and unresponsiveness of the system, the confusion over the process that was never well explained, the lack of resources to use, people to call, and the fear of ultimately never finding a position. Aside from calm, you can combat these feeling with 3 simple things: be informed, be prepared, and have support on hand. Inform yourself of the process by reading this post, checking the NRMP website, talking to your school and residents who have previously scrambled. Be prepared by have tools at hand: cellphone/landline, fax machine, computer with steady internet service, lists of programs, current copies of your CV. Get the support of your spouse, family, friends, peers, and have them ready to help you. They might need to make calls, watch the kids, prepare meals, or just be a comforting presence. The NRMP has implemented a new scramble process called Supplmental Offer and Acceptance Program (SOAP). I think SOAP is an apt name for this process, because it is much cleaner than previous scramble years. Here is the official process for SOAP (http://www.nrmp.org/soap.pdf). I like the new process, because scramble is performed exactly like match. Only unmatched applicants receive the list of unfilled positions, just as in previous years. However, now all scrambling will be performed through ERAS. Scramble will consist of several rounds of applicants and programs submitting ROLs, mini-matches being performed, and offers being made. Applicants will have a short time period to accept the offer before it expires. Then another scramble round will begin. Please read the SOAP document for specific dates and times. The SOAP documentation clearly states that applicants will not call/fax/contact programs, and likewise with programs contacting applications. Given that this is the first year of SOAP, I would not expect that policy to hold 100%. But if all goes well, the process will be smooth and efficient. Even after scramble completes, some applicants will remain unmatched. I would strongly suggest you seek guidance from your school if this happens. If you are a DO, please remember that even a month after the DO match was completed, there may still be DO positions unfilled. These positions should be available on the AOA website. You should call the programs directly and submit your application. I can look back on the 2011 match now with calm and clarity. At the time, our feelings of frustration and despair were palpable. Aside from not matching, the ERAS website crashed at the moment the scramble began, and nobody could access the unfilled position list for hours. However, based on rumors amongst peers, there was fear that some applicants at other schools had access to the list and were given a distinct advantage. Positions in Ob/Gyn (my wife’s chosen specialty) filled within the first day, and we hadn’t received a single call. In fact, we didn’t receive any calls the first 2 days. Then all of a sudden, we received 2 calls at the same time, and within 2 hours had interviewed over the phone and received offers for traditional year residencies. It happens just that quickly. But it’s scary when you are going through it, and when you look at the numbers. There are more applicants than there are positions. But be persistent, and you will find a position. A traditional year residency will allow you to begin training, and reapply for a specialty next year. Don’t forget about family medicine, which has more unmatched spots than any specialty. Above all, remember to stay calm. A friend of mine recently asked what it takes to rent your house in Des Moines, because I just went through the process last year (I guess I’m still going through it). So here’s what I told him, and I’ll add to this as I learn more. I spoke with a couple management companies and did some research. I hear the standard is that they charge 10% of the rent as their management fee. In the end, I decided to use a management company only to write/sign the lease and do background checks on the renters, and manage the property myself, with the help of my neighbors. I used Artisan, because they are close to my house. They offer a la carte services, so if I do need them in the future, I can just call them and pay a one time fee. They have 2 websites, not sure why. The 2nd is the one you want. If you want to be completely legal and everything, you have to get your house inspected by the city to get a Certificate of Inspection. Since my house in Des Moines, I went down to the neighborhood inspections division downtown (link below), they sign you up for an inspection, they give you a checklist to follow to make sure your home is up to spec. The inspector comes out, marks down anything not up to code, you have a few weeks to fix it, then they reinspect. It cost about $150, and you are legal for 3 years. Here are the things that are most important to the inspectors. Most you can prepare for. 4. Windows must be in good working order. 5. The paint on inside and especially outside must be in good condition, no major chipping. I told my insurance company ahead of time that I was renting my place so they could redo the policy. The coverage is different if you are renting it out, and I had to get an additional fire policy. When I did that, they made me get a separate electrical inspection because of the age of my home. I had the name and number of a good electrician if anyone needs one. He didn’t find any issues with my inspection, so I think it’s just a formality. I found this link that has some common landlord/tenant topics particular to Iowa. At this point, I don’t have any idea what the tax implications are for collecting rent. As I understand it, Rent is income, so you report it that way, but you also can depreciate your house for the first 10 years of rental, so it offsets. I have a tax guy, and I’m going to let him work out the details. He’s very good (if anyone wants his number).